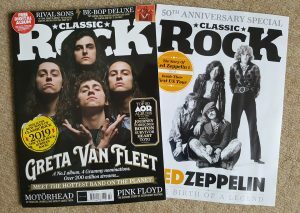 This new issue of Classic Rock has a supplement Led Zeppelin The Birth of A Legend 50th Anniversary Special. 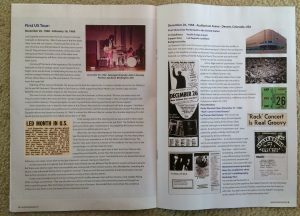 This includes a feature on their early days and the making of Led Zeppelin 1 by Mick Wall and an introduction piece that sets the scene about their impact on the US by Mike Tremaglio and… myself followed by a 12 page extract from the Evenings With Led Zeppelin book that focuses on their first US tour. Be sure to check it out this new issue of Classic Rock –aside from Zep, there’s some great features to get stuck in to including a great piece on Be-Bop Deluxe and the Top 50 AOR albums of all time and Greta Van Fleet – who as we know are causing a bit of a stir. I also have an entry in the Contributors section. IT’S HERE! IT’S FINALLY HERE! A Celebration Day indeed… in honour of Jimmy Page’s 75th birthday today, I present the phenomenal interview of Dave Lewis, co-author of the latest Led Zeppelin book “Evenings With Led Zeppelin: The Complete Concert Chronicle” conducted by Jon Kirkman. This is the interview that aired on December 16th 2018 on Classic Rock Radio that I couldn’t stop talking about. Dispersed between several live tracks from the classic “How The West Was Won” and “The Song Remains The Same” albums, is Lewis talking about the inspiration behind the book, the writing process, the focus of the book, bootleg controversies, and historical tidbits. A great tour recollection of an equally great live band. 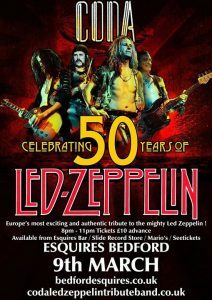 Please feel free to share this post on to your respective Zeppelin and Page friends 😉 A must listen for any Zep fan. 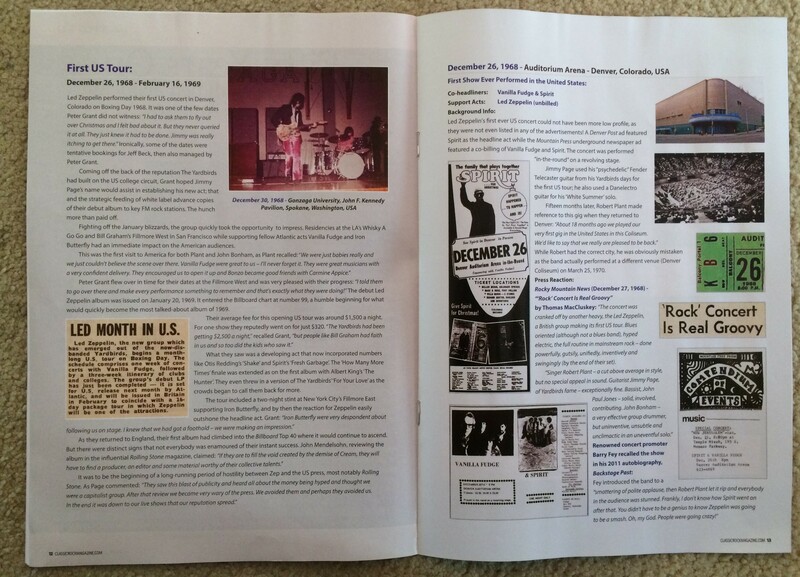 The new issue of Classic Rock Magazine includes a separate magazine about Led Zeppelin. Mark Blake, the author of the new biography of Led Zeppelin manager Peter Grant, has given an interview about his book. It was Jimmy Page’s 75th birthday on January 9, and his girlfriend Scarlett Sabet published a new photograph of him on her Twitter profile that day. See the photo here. The story that Jimmy Page’s neighbour Robbie Williams has been playing loud music and dressing up as Robert Plant went viral this week – but it’s not true. It’s the work of an anonymous prankster who claimed in a letter to live nearby, but a source close to Page told us early in January that it’s just not true. Robert Plant has contributed backing vocals for two tracks on Patty Griffin’s new album. Griffin spoke about her new album in an interview with People. January – The four new models of Jimmy Page’s recreated Fender Dragon Telecaster will be revealed. January 31 – The UK Americana Awards will be held in London. Robert Plant has been nominated for artist of the year. February 24 – The Tate Britain’s Edward Burne-Jones exhibition, which features two tapestries owned by Jimmy Page, closes. March 8 – Patty Griffin’s self-titled new album, which features Robert Plant on two tracks, will be released. April 8 – The “Play It Loud: Instruments Of Rock And Roll” exhibition, featuring Led Zeppelin items, will open at the Metropolitan Museum of Art in New York. June 13 – Robert Plant will perform in Stockholm, Sweden. June 15 – Robert Plant will perform at Bergenfest in Norway. June 17 – Robert Plant will perform at The Big Challenge festival in Norway. June 19 – Robert Plant will perform in Harstad, Norway. June 21 – Robert Plant will perform in Bodø, Norway. June 25 – Robert Plant will perform in Tromsø, Norway. June 27 – Robert Plant will perform in Svalbard, Norway. June 29 – Robert Plant will perform in Svalbard, Norway. July 2 – Robert Plant will perform in Halden, Norway. July 10 – Robert Plant will perform at the Kunst!Rasen Bonn festival in Germany. September 20-21 – The 2019 John Bonham memorial concert is scheduled to be held in Redditch. November – The “Play It Loud: Instruments Of Rock And Roll” exhibition will move to the Rock & Roll Hall of Fame. Robert Plant, Sheryl Crow and Hozier are among the all-star line-up set to headline the third annual “LOVE ROCKS NYC” benefit concert, which will raise money for for God’s Love We Deliver. The concert, hosted by Whoopi Goldberg, Martin Short and other special guests, will take place at New York’s Beacon Theatre on Thursday March 7th. The line-up will also include Buddy Guy, Billy F Gibbons, Grace Potter, Keb’ Mo’, Taj Mahal, Lukas Nelson and Ivan Neville, among other artists, and more names are set to be announced. The evening will also feature a house band that brings the likes of musical director Will Lee, Paul Shaffer, Steve Gadd, Shawn Pelton, Larry Campbell, Eric Krasno and Jeff Young together on the stage. The event is being presented by fashion designer John Varvatos and NYC real estate broker and God’s Love We Deliver Board of Trustees member Greg Williamson. But it’s important to note that while revenue serves as the basis of the ranking, Billboard only counted revenue where the consumer made a choice, either by downloading a song or playing a stream on-demand. That means that other revenue generators — where professionals make choices like which songs to play on the radio, or which song to put in a TV show or to physically release as a single — were not considered, because the consumer wasn’t involved in those choices. Therefore, this list is a true gauge of the popularity of the songs within the band’s catalog, because the Zeppelin fans’ actions generated the revenue upon which this ranking is based. Here now is Billboard’s ranking of the most popular Led Zeppelin songs as voted on by U.S. consumers with their time and money, with an observation or two about each of the 94 songs — total revenue generated: $21,607,542.71 — in the band’s catalog. The 20 best Led Zeppelin songs ever as voted for by Planet Rock listeners. As part of Planet Rock’s ‘Zeptember’ celebrations marking Led Zeppelin’s 50th anniversary last September, we asked you to have your say and cast your vote on your favourite Led Zeppelin track from their distinguished back catalogue. 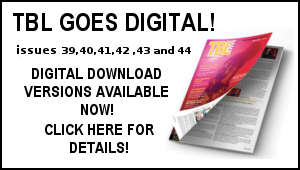 A commentary by Larry M.Bergmann, Jr. 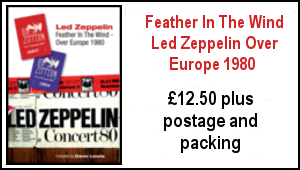 So you have the Evenings With Led Zeppelin book before you – and if you are reading this and have yet to indulge – you really should do – ordering details below..
Where to begin? It’s actually no small question as Evenings With Led Zeppelin – The Complete Concert Chronicle by Dave Lewis and Mike Tremaglio is such a major piece of work, and a major accomplishment, that its 576 pages, over a quarter of a million words, countless images, newspaper clippings and other ephemera, will likely take one a lot longer than a few mere evenings to make one’s way through it all. And that is certainly not a criticism! Right up front and simply and obviously put, the book is stunning. The passion, research and execution that went into this is almost incomprehensible. Messrs. Lewis and Tremaglio have much to be proud of. Lewis calls Tremaglio’s research “second to none”, and I suspect no reader will quibble! One can and will get happily lost in this book. That said, this volume is more than a little daunting. There’s so much information on display that it was difficult in the beginning for yours truly to imagine taking it all in. I gave it a cursory look-thru upon receiving it, and then eyed it a bit warily for days afterward. I’m the type to usually dive into a book and devour it as quickly as I can once underway (I like to read, to understate the matter). As that wasn’t going to happen here, I just made my peace with it and started reading it as I could. It was certainly a nice coup to get Zeppelin tour manager Richard Cole to provide the Foreword, and he does so eloquently. He was there, after all, and his contributions to it all are perhaps not regarded highly enough. As one can gather from having all of this information displayed in such compelling fashion, there was a lot more to a Zeppelin tour than just playing the gigs and fishing for mud sharks. While manager Peter Grant and Cole headed a tightly-knit unit to shepherd the band from gig to gig, they were contending with so many challenges and roadblocks it defies the imagination. True, they were tough men and went over the line at times. But they were also dealing with tough people who didn’t have their and the band’s best interests at heart. There’s likely no one in the music business today who could do what Grant and Cole were doing back then, no rule book, some shady characters from which payment had to be secured/extracted, very little in the way of security. And of course there’s no one in the music business today like Led Zeppelin! The first thing that strikes during the Prologue is the depth of information and attention to the pre-Zeppelin era/dates. 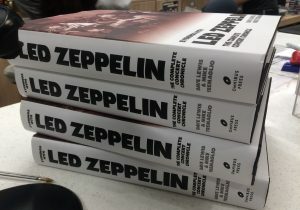 This is such an inspired aspect of the book, and will serve as a major reference now and in the future for any and all Zeppelin fans/scholars. It must rank as the most comprehensive history of the pre-Zep era to date. It’s a real treat to take in the information on display here. 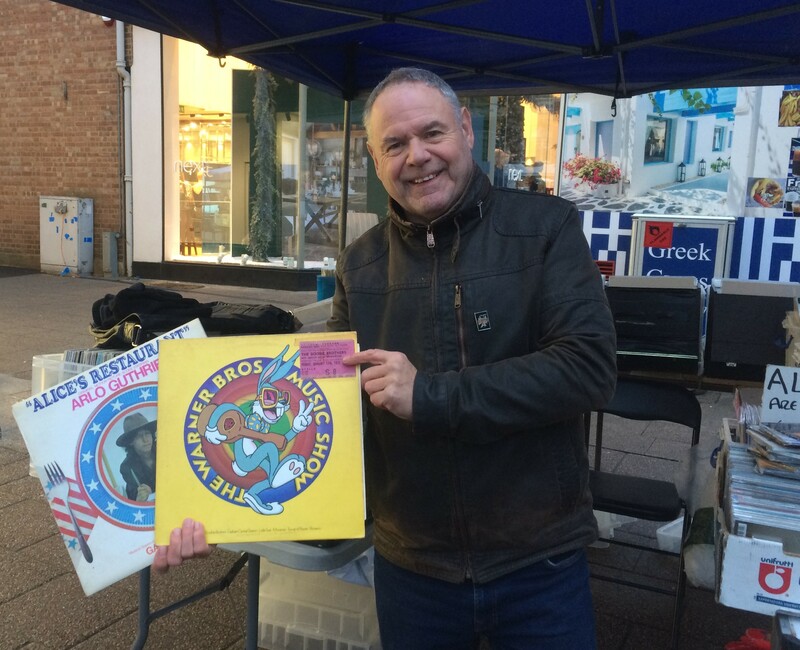 Obs-Tweedle, Band of Joy, Yardbirds, sessions…it’s all here. The appearances of the concert adverts, newspaper clippings, photos, tickets, comments about bootleg recordings, etc. etc., all coinciding with the corresponding dates, will add to the readers’ enjoyment. Many of these items are absolutely spellbinding. The clipping “Two Yardbirds Fly” on page 18 is interesting as it quotes Page talking about touring with a mellotron on a presumed Yardies return to the US in October 1968. There’s also a fascinating section on pg. 19 replete with Page comments after the Yardbirds had split. The entry for July 19 in which one John Paul Jones contacted Page about joining a new version of the Yardbirds is also a very nice detail. Then we see that July 20, 1968 is considered the likely date of Jimmy Page, Peter Grant and Chris Dreja going to see Robert Plant perform with Obs-Tweedle. On July 23-26 we have Robert Plant traveling to Pangbourne for his first meeting with Page. On July 31, Plant takes Page and Chris Dreja to West Hempstead to see a J.H. 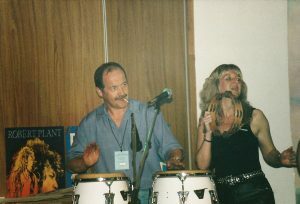 Bonham play the drums on a Tim Rose gig. Pages 22-28 are a vital and well-executed telling of the run-up to the formation of the New Yardbirds. As we get into the liftoff of the Zeppelin (billed as the “Yardbirds” for the first several weeks of gigs), we are greeted with a couple of Jorgen Angel’s historic photographs of the band’s first concert in Denmark on September 7, 1968. It’s a different book of course, but at this point I feel compelled to mention Angel’s recent release of Danmark 1968-1970, a volume which is essential in its own right. On page 37 there is mention of the complaint by some over the years that Zeppelin’s version of You Shook Me cut too close for comfort with Jeff Beck’s version, and it’s correctly intimated in Evenings With that Page’s version was more well realized. But in fairness, I think it should also be noted that the similarities had little to nothing to do with the rather pedestrian version of the song which appears on Beck’s LP Truth. One has to listen to the live arrangement of the piece that Beck and Rod Stewart were serving up whilst touring Truth to discover the likely source of Beck’s angst, while also considering that (as mentioned in the book) Peter Grant was managing Beck during this era, and Page had seen the band perform live on that tour. That said, also in fairness, it seems here that Page was perhaps more clever and driven than Beck, and he certainly made better records. 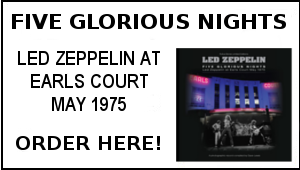 A great moment comes in the December 10, 1968 Marquee Club entry with a priceless comment attributed to Club manager John C. Gee, sourced from Ritchie Yorke’s seminal Led Zeppelin Biography. The December 28, 1968 appearance in Vancouver proved a perturbing experience for reviewer Jim Allan of The Columbian (perhaps the first, but certainly not last, scribe to opine that the band had gone over like a “lead balloon”? ), and his wry re-evaluation of his own commentary 44 years hence is a hoot. As we get into 1969, pages 53-56 on their crucial dates at L.A.’s Whisky and the Fillmore West in San Francisco are absolutely superb, and one of the best passages in the book. In fact, all of the important early gigs and stands are well covered…the Grande Ballroom in Detroit, the Boston Tea Party run, the four shows in two nights at New York City’s Fillmore East…according to reviewer Denise Kelly, it was here that the band encored with Donovan’s Season of the Witch…where’s the tape?! (Not the last time I’ll hopelessly pose that question)…and there’s also an entry on that great white whale of Zeppelin gigs, the Wheaton Youth Center in Wheaton, Maryland. And why not, surely it must have occurred! There’s a lovely color shot of the band at the Danish TV shoot on page 68. There’s a date in Wolverhampton on February 24, which doubled as a birthday party for Bonzo’s wife Pat. Tape, please! The first BBC recording for Top Gear on March 3 at the Playhouse Theatre, London. I never tire of reading about (and listening to!) these great BBC recordings, all absolutely vital and among the earliest offerings available on bootleg back in the day. On March 13, our licentious heroes arrived at Leicester University to play the “Pyjama Dance”, of all things. You can’t make it up! On page 75, we find what seems to me a hitherto unseen Danish promo flyer featuring a gloriously absurd pink-tinted photograph of the mighty Led Zeppelin, all four of them seen laughing and running through a field, looking for all the world like the New Monkees! You’ll have to buy the book! Next, the momentous dates of March 17 and 18…the Danish TV broadcast, and the next day’s filming for Supershow in Staines, England. The Danish TV appearance proving an historic half-hour of sublime Led Zeppelin, and then Supershow featuring an absolutely ferocious performance of Dazed And Confused. Without doubt two of the most crucial visual testimonies of the band. I was surprised the April 26 Winterland performance wasn’t mentioned as a Bootleg Recording, as it’s one of the all-time great gigs, and features a towering version of Killing Floor, with a little bit of La La thrown in for good measure! 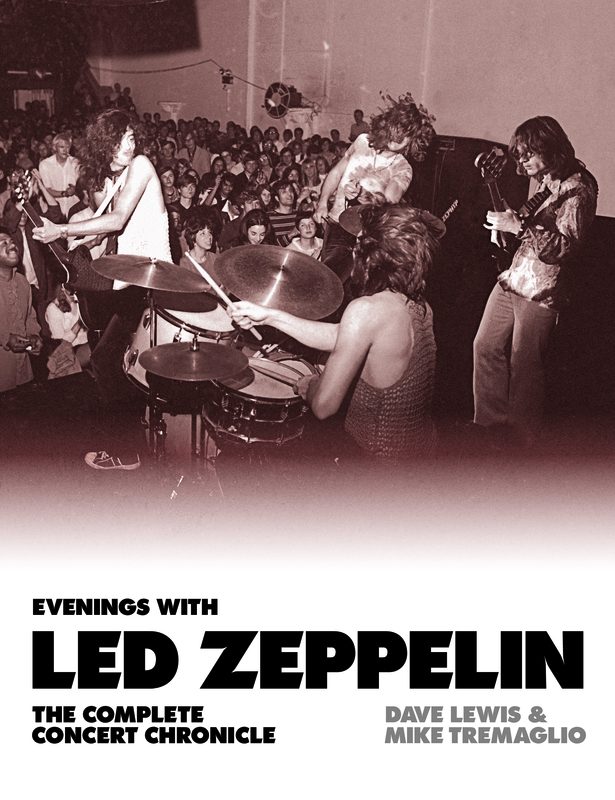 May 11, Green Lake Aqua Theatre, Seattle – agreed that this was one of the more unusual venues the band ever played and there should have been one or two of the very cool photos from this gig in the book. 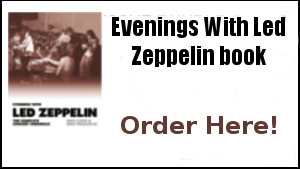 Zep on a double bill with Three Dog Night…Janine Gressel of the Seattle Times thought the Dog stole the show. I wasn’t there and I tend to like Three Dog Night, but, well…go jump in the lake! There are four superb color shots from the May 16 Grande Ballroom gig in Detroit to be found on pages 100-01. One of the more interesting entries is from Athens, Ohio on May 17, which found Zep opening for the great Jose Feliciano. June 16 finds another BBC performance and the 19th finds the boys in Paris filming the Tous En Scene appearance…the book reveals that Jukebox magazine wrote that besides the famous clips of Communication and Dazed, the band also played White Summer, Good Times Bad Times and Whole Lotta Love. Footage, please! June 24 brings the BBC session for John Peel, one of the great moments…Whole Lotta Love months before it would be released, and the glorious Traveling Riverside Blues…then of course June 27 brings the famous Playhouse Theatre gig. Again, just monumental performances, and thank goodness these recordings didn’t also get wiped! The crucial gig at Bath occurs the following day, and then on the 29th, well, just a little date at the Royal Albert Hall…surely someone had a tape recorder running on these occasions! Atlanta Pop July 5, from reviewer Shayne Fair, “The closest thing to a riot Atlanta has seen took place during How Many More Times”. Nicely done. From Vancouver on July 26, reviewer Ken Spotswood has the band doing a 15 minute Chuck Berry set, presumably during the encore. Tapes! We get some very cool (but too small) photos from Asbury Park August 16. Good to see the reviewers of the day liked the August 31 set at the Texas International Pop Festival in Dallas, without doubt one of the great gigs thankfully preserved for the ages by a great bootleg! Carnegie Hall October 17, where are the tapes, it’s unimaginable that this gig wasn’t recorded… Some nice photos accompany the Detroit gig from the following evening. Boston October 25…after the great success and warmth of the earlier gigs at the Tea Party, Zep play Boston Garden for the first time, a venue which they ironically would not fare as well with as time went on…although on this night they went down a storm and ended the show with Long Tall Sally. Although great to have included them in the book, to me some of the reviews tend to blend into one another, which is unavoidable in an enterprise such as this. But then there are those that provide a laugh, or make one go “What??!!”. Or, “where’s the tapes? !” But it’s also easy to see how the band quickly soured on the press…the reviewers were generally more receptive in the early days but of course things got worse later. And then the final gig of the beginning…the categorically immense gig from the Ecole Centrale in Chatenay-Malabry, France on December 6…the show was for the students of the school exclusively…the discovery of the tape is one of those little gifts that float out to the masses from time to time, just when one might be thinking “Gee, when’s the next new tape going to pop up?” This one’s a corker and one of my all-time faves. And that marks the end of the 1969 section. Of the 576 pages of text in Evenings With Led Zeppelin, it comes as no surprise that the early days of the band take up 173 of them. The earliest days were the busiest days, and in many ways the most interesting and important. There certainly weren’t any boring periods in the band’s history but the early days, the beginning of the ascension, is where the foundations were laid and the band certainly had the wind at their back. Still plenty of great stuff 1970-80 of course, and I look forward to enjoying the rest of this splendid book! Back in early 1980 I contacted Mick to request some of his amazing photos he had taken of Led Zeppelin at Knebworth to use in the then forthcoming TBL issue 4. He was more than generous in supplying a whole batch of previously unpublished shots. That generosity and great spirit was well in evidence years later, when along with other members of the wonderful Bonham family, Mick attended the 1992 Led Zeppelin Celebration Days Convention Andy Adams and I staged in London…here’s a great pic taken by Jan Mulder from that weekend of Mick on stage with Deb and the band –RIP you lovely man…. 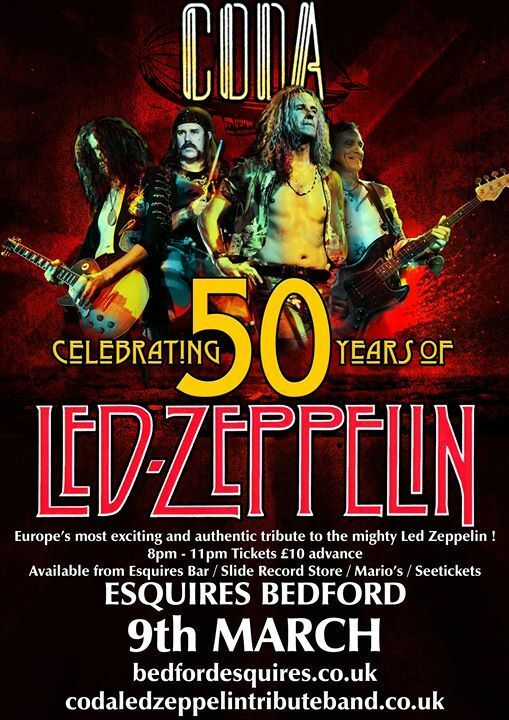 Russell Clarke will be featuring Led Zeppelin on his radio spot during the Robert Elms show next Wednesday January 23 at 12, on Radio London 94.9FM. Friday treats at the Vinyl Barn – at the always excellent Vinyl Barn last Friday, I was well pleased to find a copy of the Arlo Guthrie Alice’s Restaurant Soundtrack – a United Artists UK pressing plus the Warner Brothers Music Show sampler album. This was released in January 1975 to promote a series of Warner Brothers artist concerts at the Rainbow Theatre in London including The Doobie Brothers and Little Feat – and this copy has the original Rainbow Theatre ticket for The Doobie Brothers appearance on January 17,1975 supported by Montrose (entrance £1.80) attached to the sleeve – result! Thanks Darren! I really enjoyed the BBC 4 On Drums… Stewart Copeland programme aired last Friday. There were plenty of John Bonham references of course and it also reminded me what a great drummer Stewart Copeland is –as can be heard on tracks such as the brilliant Spirits In The Material World by The Police. It had me searching out the Police Greatest Hits album and very good it sounded too. Spurs did everything by score against Manchester United last Sunday bit alas, United took the points with a fine Rashford goal. With Harry Kane injured at the end of the game and out for a reported eight weeks, it’s going to be a testing time for Spurs ahead. Hopefully an emphatic win at Fulham on Sunday will regain their momentum. 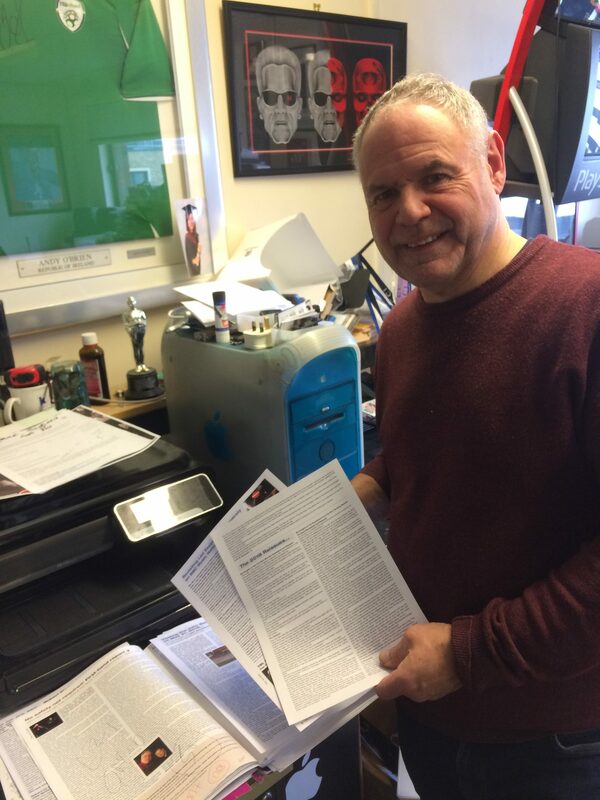 A very full on week here working on the in progress TBL issue 44, with some intensive design work with Mick Lowe at StudioMix bringing more pages in line. There will be more of that ahead. 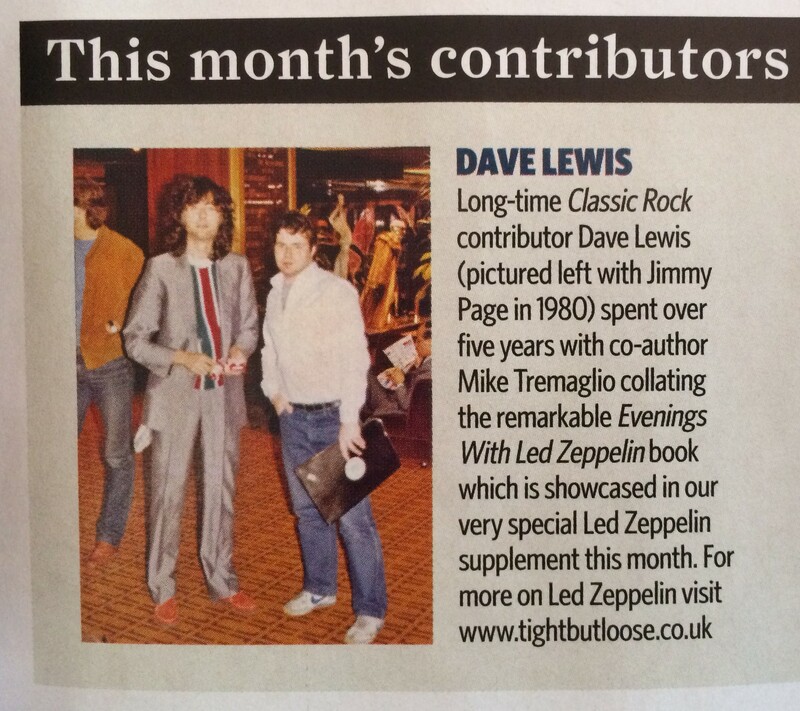 There’s also been the signing off of a Zep feature Mike and I have been working on for a few weeks. More details on that very soon.